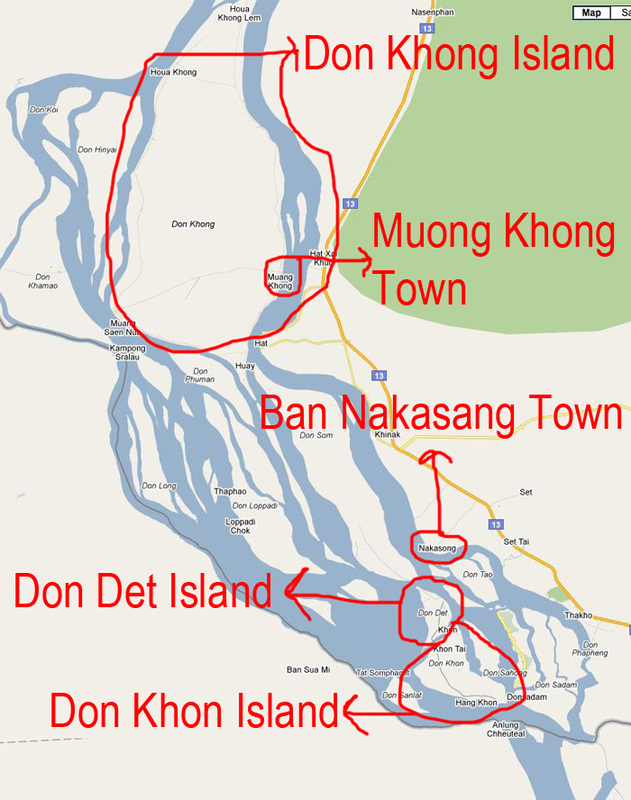 This is Part 1 of the 4000 Islands (Si Phan Don) of Southern Laos covering How to Get to the 4000 Islands and the Island of Don Khong. Check out Part 2 for information on the popular Don Det and Don Khon islands. 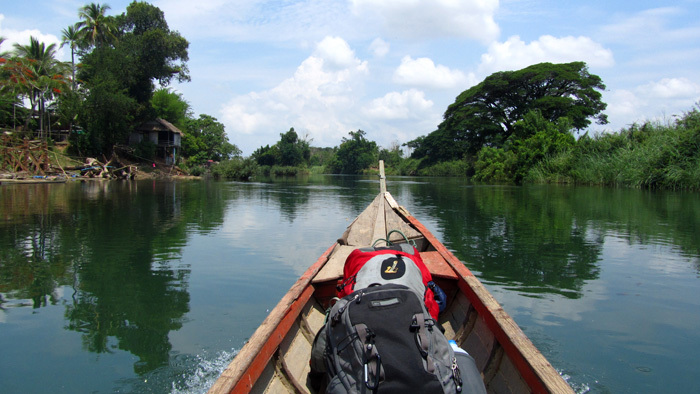 There seems to be some confusion about traveling to the Southern portion of the country of Laos, an area known as the 4000 Islands (Si Phan Don) in the Champasak Region of the country. 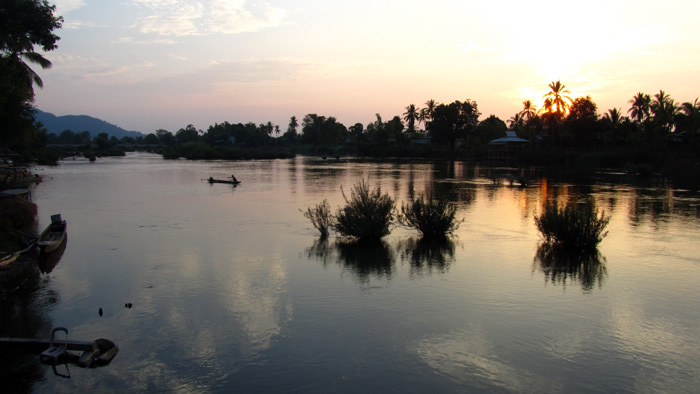 The name is derived from the mega Mekong River that spreads itself out, choosing hundreds of routes and forming a vast area of river islands, possibly 4000 of them (Si Phan Don means 4000 Islands in Laos)! From the assortment of information scattered on the web, I was slightly confused myself, so I decided to check things out and relay on the information as clear as possible. There are 3 main tourist islands to visit within the 4000 islands: Don Khong, Don Det, and Don Khon (I know it’s a bit confusing). Don Det and Don Khon are like sister islands (see map above), connected by a decent sized motorbike and foot bridge. Get to Don Det, and it’s not hard to WALK to Don Khon. Internet: There is internet available at the absurd cost of 400 Kip ($0.05) per minute! It depends on what island your destination is, but it’s often most practical to start from Pakse, the largest Southernmost town of Laos. 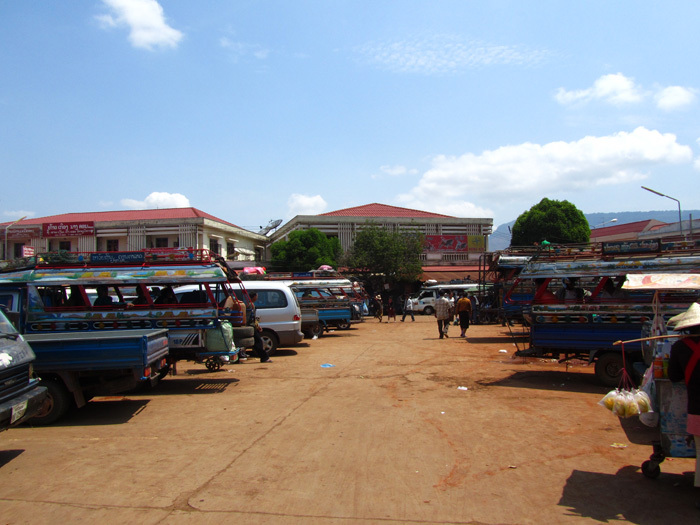 Pakse is easily accessible by bus from other parts of the country as well as from Thailand. I personally took a bus from Savannakhet, Laos (after getting a Thai visa in Savannakhet) all the way to Muong Khong Town (on the island of Don Khong). 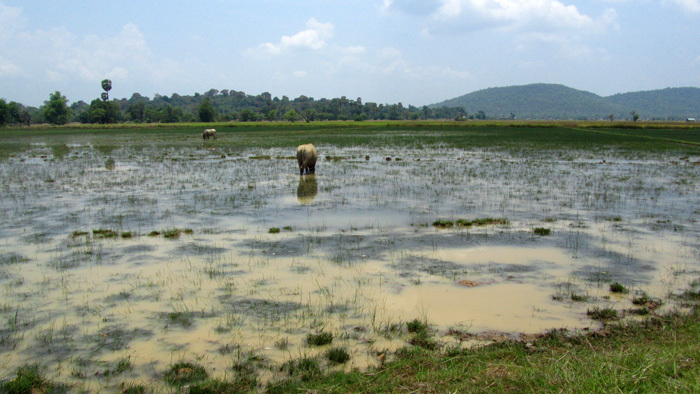 Once you are in Pakse, there are options to take transportation to the small town of Muong Khong Town (island of Don Khong) or to Ban Nakasong Town (entrance town to Don Det and Don Khon islands). Tourist Bus: The tourist bus leaves Pakse in the morning hours (8 am, 9am,) and heads down to Don Khong and Don Det, the price is around 60,000 Kip ($7.49) from most tour agencies. It includes a bus and boat combination in the same ticket, and there shouldn’t be any complications. Local Transportation: If you want to take the more local adventurous route, or if you need to depart in the afternoon (tourist buses only leave in the morning), the option is to take the local songthaew (pickup truck) to either Muong Khong Town or Ban Nakasong Town. The trip takes about 3 hours and costs 35,000 Kip ($4.37). After arriving in Ban Nakasong one must hire a boat for 15,000 Kip ($1.87) to get to Don Det island (the truck will cross the ferry to go to Don Khong – Muong Khong). The island usually attracts an older, less party happy crowd of tourists. Despite the 10 or so guest houses on the island, there were only a handful of others when I visited (very nice!). Don Khong island is the biggest of the 4000 islands yet still remains sleepy, laid back, and extremely friendly. The size of the island makes it easier to get off the normal route of all travelers, cruise around on a rented motorbike and discover hidden coves or ancient rice farms. 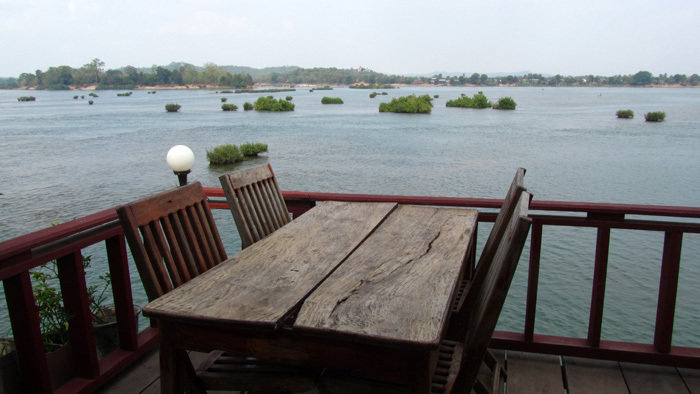 The main strip of guest houses is pleasant, extremely quiet, and also offers scenic restaurants overlooking the Mekong River. I stayed at Souk Sabay Guest House, a decent clean place to stay with a river view dining area. The guest house also offers a small store, a restaurant, and a motorcycle rental. They can easily help you arrange transportation for your next destination. Located right next to the Souk Sabay Guest House, it offers nearly the same accommodation options and prices but offers more help in the tour planning area. You can check out there website. Has some of the most complete information on traveling around the 4000 islands and is also the jump off for taking a boat to Don Det. Morning Market: The 6 am morning fresh market of Don Khong brings the island together with a small scale bustle of food necessities. There are a number of stands that sell fantastic street style meals, including a lady that sells magnificent fresh Laotian spring rolls. RELAX: By far the most widely accepted thing to do on the 4000 islands! 1. Direct Boat: the boat takes about 1.5 hours and the cost is 40,000 Kip ($5.00), usually leaves at around 8 – 9 am (depending on amount of people) from the front of Don Khong Guest House. All the tour groups sort of just pool together wherever you purchase your ticket. 2. Take a small boat across the river to mainland (15,000 Kip ($1.87)), take a songthaew (pickup truck) down stream to Ban Nakasong Town (see map). Once in Ban Nakasong, take a small boat on the river to the island drop off point of Don Det (15,000 Kip ($1.87)). If you want to avoid hassle, just take the 40,000 Kip ($5) boat ride down stream. Continue to Part 2 for Information on Don Det and Don Khon! 37 comments. I'd love to hear from you! I have to comment that post;) wifi is in almost every guesthouse, slow but free. Food bettter, cheaper and more to choose on Don Det peace, slow life, and total quiet darkness on Don khon! Didnt see Atm though on don det. Not many fruits to buy, but possible to get in few stores on Don Det. 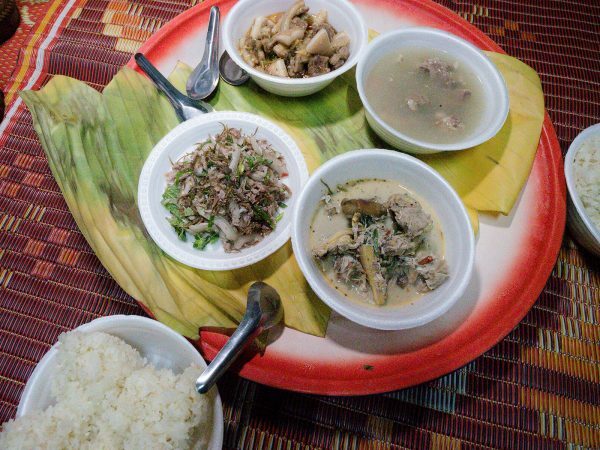 Thank u for that post it was really helpfull before i have got here, place to stay i can recommend is Pakha guesthouse (don khon) place to eat Crazy Gecko (don det). Ohhhh amazing beach on the Somphakit Waterfall worth of spending there a whole day! Nice Adventure.. Question From Don Det or Don Khon its a possibility to reach Vientiane or Luang Prabang cause pakse would be my last destination before heading to Siem Reap? Does it cost a lot? I saw from lonely planet that only Don KHong is the one offering a bus trip to Vientianne..
Can you say, more or less, how i find Souk Sabay Guest House? 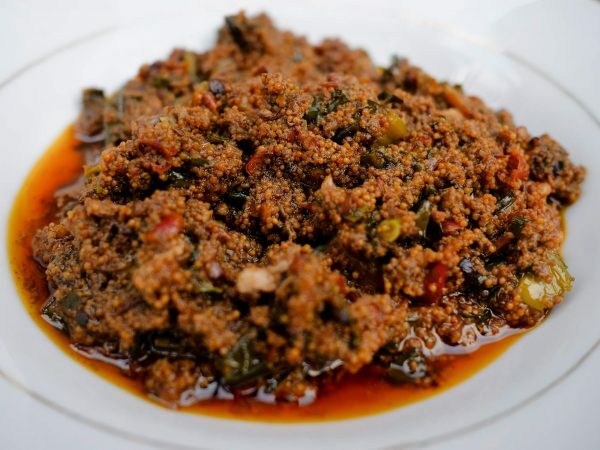 Love your pictures and the food looks great. I’ll have to check out the Veggie Patch if I return for a visit – that pumpkin gnocchi sounds great. That’s incredible how they can make food like that in the middle of Don Det! Very well put together! What a beautiful place.. I’ve looked this place up a while ago, but I can take this as my guide when I go! 🙂 Great job Mark!! Thanks Juno! Do you have plans to visit soon? I know you will enjoy it! I had never heard of the 4000 Island before, but they do really look amazing. Definitely a place worth visiting and to relax for a while. Yes! If you visit SE Asia and are looking for relaxation, Don Khong or Don Khone are great options! Wow, I knew nothing about Laos so this is interesting information. Mark, I end up learning a lot from you because you go to so many places I’ve never considered. 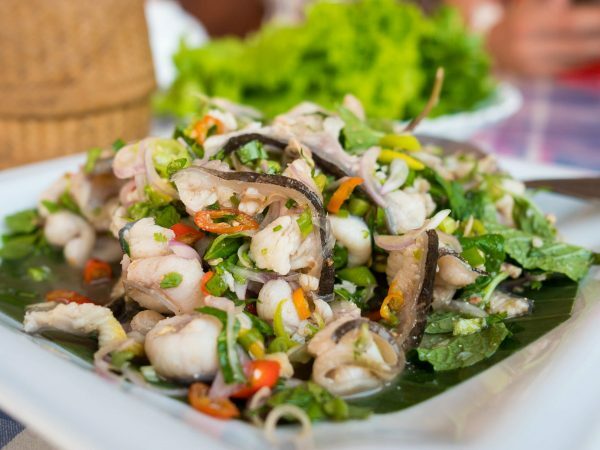 Don Khong sounds like a great place to stay – just relax and explore and very affordable! Thanks Jeremy! Yes, and Don Khong was the quietest of the islands, a wonderful place to spend some peaceful days. I’m hoping to see you and your family over in this part of the world sometime Jeremy! 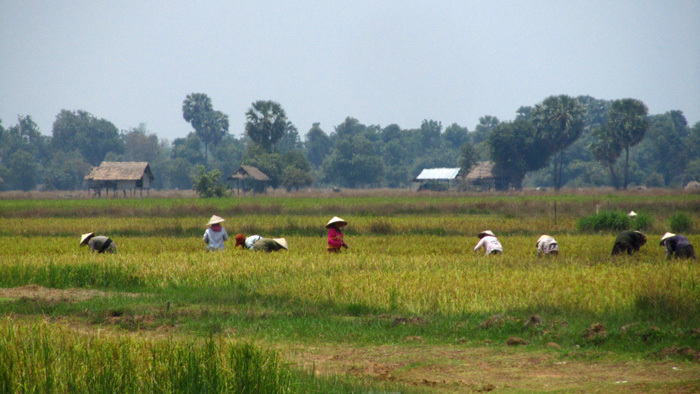 We didn’t make it to Laos on our last trip, but really want to get there sooner rather than later. The sunset is reason enough! The sunsets over the 4000 Islands are enough to spend a few nights! Hope you have a chance to visit sometime! Totally amazing! I missed out on many of the other places in Laos so this gives me a chance to make another trip soon. Thanks Mark! Great David! Living in Thailand I need to get Thai visas from time to time, giving me a great chance to easily visit Laos and do a bit of exploration every time. I’m sure you will enjoy Southern Laos as well! The temple of Wat Phu was especially incredible, I’ll write about that soon! I really wanted to get to this area of Laos when I visited the country three years ago, but didn’t have enough time. I think it’s great that you are including prices for services in your post. Looking forward to the next entry. Thanks David! I’m sure it was much less developed 3 years ago – that would have been really nice. Though it’s still incredible, it seems the 3 main islands are all changing everything – just to accommodate to tourists. What a surprise this article. With prices and outlooks from hotels like that you could stay forever. Pretty much! A small amount of savings will take you a long ways around the 4000 Islands! It’s also nice that the main activity is relaxing, and it doesn’t take too much money to do that! It’s just so spectacularly beautiful. Thanks Paulo, a definite ideal location in this world for ultimate relaxation! Have you spent time at the 4000 Islands? A thorough and comprehensive guide here – to a part of Laos one doesn’t hear much about. Well done! Wow, those prices are incredible! No wonder so many tourists head to Laos. I’ll be interested to read your next post. Thanks Jan! Yes, among the great things about traveling to SE Asia is that prices are often very affordable if not cheap. It’s definitely possible to get away with spending less than $10 per day around the 4000 Islands!